You might remember last week, I told you about my favorite marker to letter on wood. This week I want to tell you something that will sound a little bit funny actually, because that same weakness that I mentioned last week about the Sharpie Water Based became a strength for this project and it made me choose the Sharpie marker over the Molotow one. First, let me tell you more about this project. So, I had to write 20 signs on black paper 8*11 in. These signs were going to be used as props in a photo-shoot at a school in San Jose, CA. 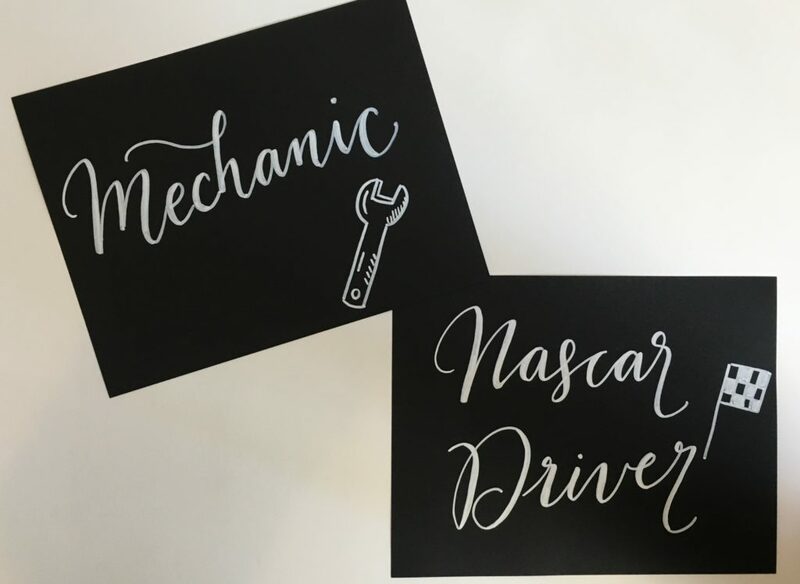 They wanted this idea of black backdrop/white ink kind of a chalkboard thing but didn’t want to use actual chalkboards (better buying paper vs. buying 20 chalkboards) so I thought that the best tool for this project could actually be the Sharpie Water Based! Why? You already know it! The Sharpie acrylic water based marker isn’t very uniform, it’s also not as opaque as the Molotow and it is even a little bit transparent/watery sometimes. All of those reasons helped to actually give a similar appearance as the regular chalk. You see? There’s no ONE marker for all of the projects, no ONE marker that magically works with all of them (although, there is the a ring to rule them all 😛 remember I’m a little bit of a LOTR fan). There are projects and tools. And we’ll need to find what’s the best union for each one.